It's no surprise that the Washington Wizards main focus in game 5, and really the majority of this series, was stopping Isaiah Thomas. 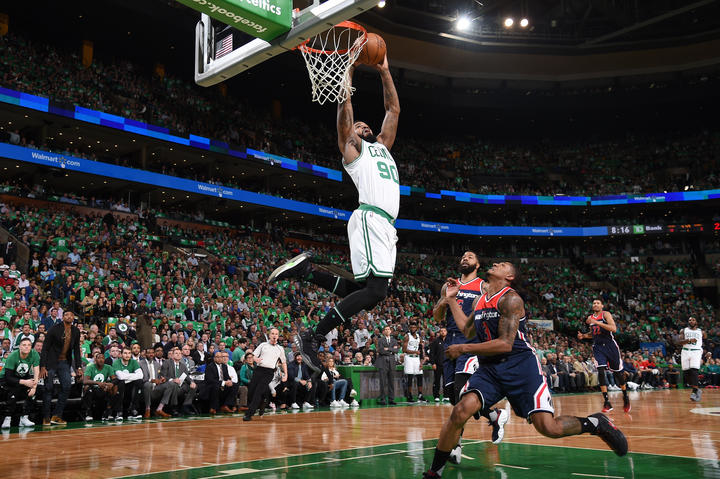 After he dropped 53 points on the Wizards in game 2 Washington ramped up those efforts to thwart the Celtics top scoring option. Isaiah attempted 56 shots in the first two games of the series, both Celtics victories, and as the series shifted back to Washington the Wizards were much more successful in keeping IT from getting quality shots through double and triple-teaming him and using a myriad of methods to deny him the ball at all as he was held to a mere 22 shot attempts through games 3 & 4. While the Celtics utilized some unique methods of spreading the floor by having Isaiah draw attention away from his teammates by walking off the floor multiple times in the first half of Sunday's game 4, the 2nd half featured him and other Celtics falling into the Wizards' hands by forcing their offense rather than taking what their opponents were giving them. The results were turnovers that led to fast-break points that ultimately culminated in the now infamous 26-0 run that buried the Celtics Sunday night. Last night was much different. The Wizards continued to ramp up the pressure and their focus on Thomas, and yet this time the Celtics responded by using that very strategy against them. We've been talking all year about how effective the pick-and-roll with Thomas and Al Horford has been. It's one of the most efficient PnRs in the league and probably the Celtics most efficient way of scoring and creating offense in half court sets. Well last night coach Brad Stevens decided that was going to be a key to the Celtics success, except this time Isaiah was going to be setting screens for Horford - and it worked like a charm. Thomas would set a screen for Horford, usually on Marcin Gortat, and the way the Washington defense would react would dictate what would happen next. Horford would either roll to the hoop and create a mismatch on a switch or pop out for an open shot if Gortat tried to go under the screen. Isaiah setting screens created a great deal of confusion in the Wizards defensive sets and it seemed to be something they were totally unprepared to counteract. "We took what was on the whiteboard and we put it on the court," Isaiah Thomas says of the team's execution during tonight's Game 5. Avery: "It can’t just be Isaiah Thomas every night. If we’re able to understand that & he's able to believe in us, the sky’s the limit." "The first part of our mindset was to throw it to our team," said Celtics head coach Brad Stevens, referencing his team's bad turnover habit earlier in the series. "And then everything else was about if they're going to load up on the ball we need to be really active cutting. And so we tried to be a little more active cutting than we were in the previous couple of games and -- whether it's drives, cuts, extra passes -- then another drive, the second time it hits the paint is usually a better shot than the first time."